Trish Hyatt Horse and Rider Training Trish Hyatt – Equine Language Specialist – Changing The Horse's World, One Human At A Time. horse and rider training tips. I won't flood your inbox with emails. It is easy to unsubscribe if you need to. and the 3 training tips you will learn from this series. Help your horse be more Calm, Focused and Responsive. 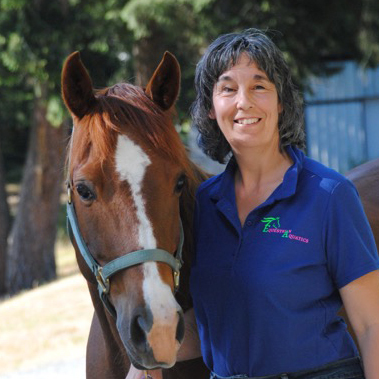 Trish Hyatt has been training horses and riders for over 40 years. Trish was recognized in 2007 as the top certified trainer of the Chris Irwin method of horsemanship. She has continued to expand her education since in the fields of horse and rider biomechanics (Trish is the Vice President of the International Association of Equestrian Biomechanics), physical fitness (she is the creator of the online rider fitness program Equestrian Aquatics), and is intersted in any techniques that serve to further her understanding of how to work with a horse in a way that’s in the horse’s best interest. Trish is the BC Director for Working Equitation Canada as well as an International Competitor, Coach, Trainer, Technical Delegate and Judge of Working Equitation. Trish Hyatt puts her many skills to use introducing the international discipline of Working Equitation to riders eager to improve their partnership with their horse, with a focus on fun, classical horsemanship and use of the horse for practical work or as cross-training for other disciplines. Trish's superpower is the ability to give you and your horse what you need in a way that you understand so each horse and rider makes progress and knows what they need to work on. WE BC website, click pic. ​Arrange a small group of friends or come for a private horse and rider training lesson. Whether you're attending a pre-organized clinic with a set theme, or hosting one yourself you can always be assured that your horse and rider training needs are my highest priority therefore your portion of the program will be modified as needed for success.